I have been meaning to make this changing station for ages. 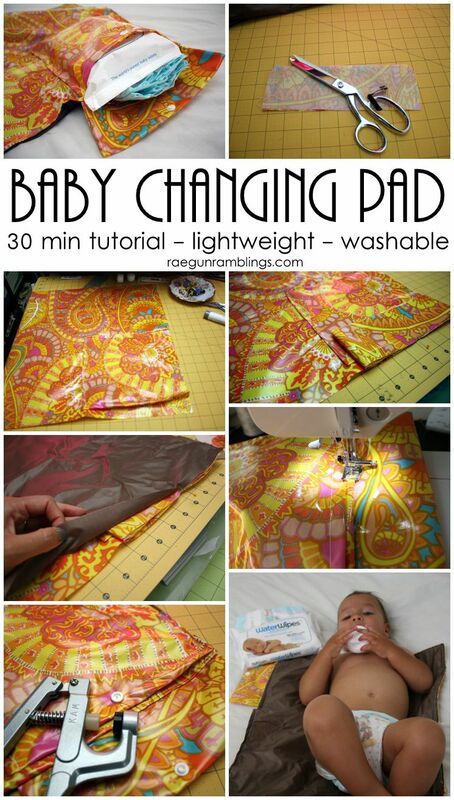 We use the easy peasy changing pad every single day but I wanted another with a pocket that I could take with us on the go so I would have to keep track of the first one. I couldn’t be happier with how this turned out! When I was looking for changing pads in stores they were 1. ridiculously expensive 2. super heavy and 3. crazy bulky. This is thin but still does the job and as an upgrade from my last version has a pocket big enough to hold wipes and a few diapers. I made this one big enough to fit my WaterWipes pack which are my new favorite wipes, but it should also fit other style of wipe cases too. 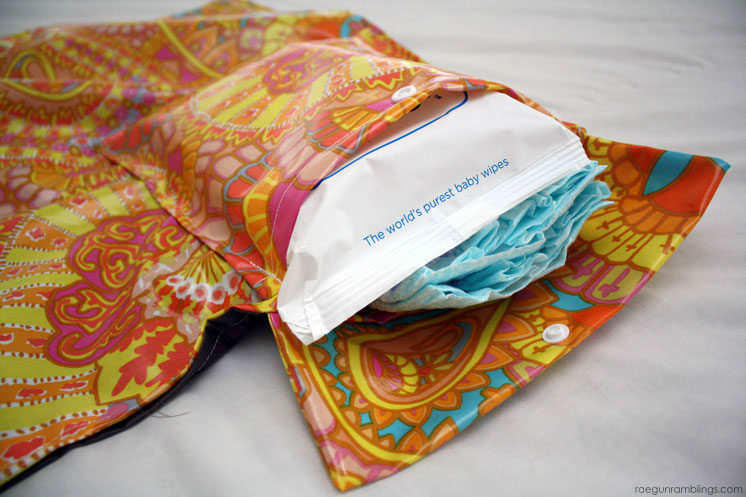 If you don’t already know about WaterWipes these are awesome and new to the US (they’ve had them in Europe for a while) and available at Babies “R” Us back by the diapers. Unlike even the “natural” or “sensitive” baby wipes these don’t have all kinds of crazy chemicals. These just have two ingredients: 99.9% Irish water that has been specially purified and softened and 0.1% grapefruit seed extract. I don’t even think twice about wiping his face with these where as I was always weirded out by the other kind to do anything but wipe a bum haha. Start by making your pocket flap. 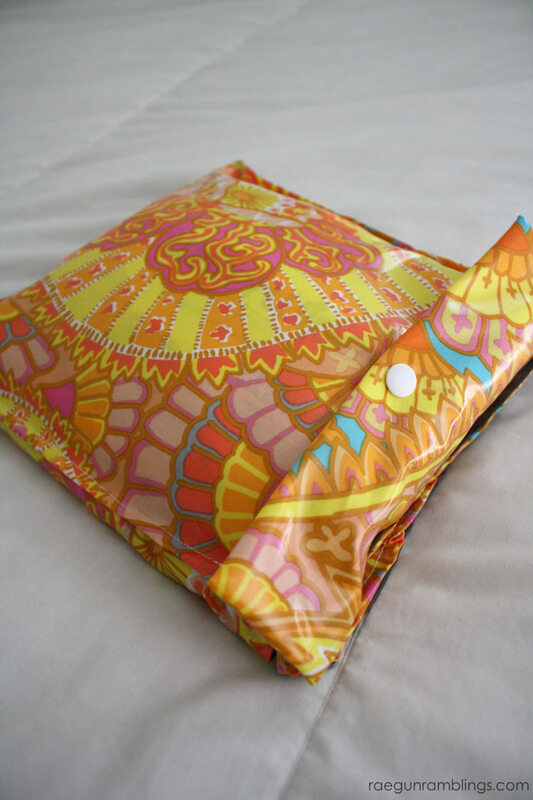 Fold the pocket flap piece right sides together so you have a rectangle that is 3.5×9 inches. Sew up the side and clip the corners. Turn right side out. Fold one of the 10 inch sides under a 1/2 inch and sew down. Then lay the pocket with the unsewn side lined up with the center of the top edge of the back piece. Fold under the 10 inch unsewn side and the 9 inch side that is on NOT on the edge of the back piece. Sew along both edges of the pocket. Position the pocket flap in the center of the pocket lining up the raw edges with the edge of the back piece. Lay the rip stop on top of the back piece (on the right side, the pocket side). Sew around all the edges leaving a 3 inch hole. Turn right side out and with the pocket flap open top stitch around all edges 1/4 inch closing up the hole. Add your snap to both the pocket and the flap. 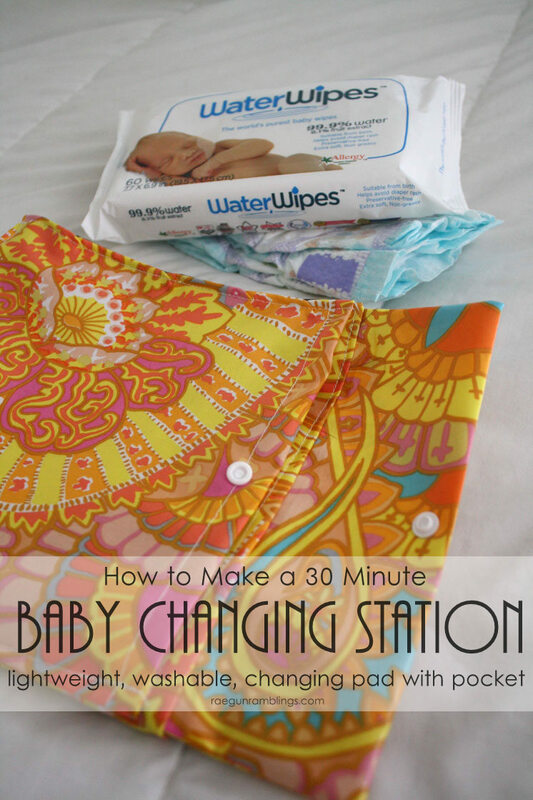 I hope you like my easy changing station and if you’re interested in trying chemical free wipes I highly recommend the WaterWipes. They are really durable and definitely do the job. 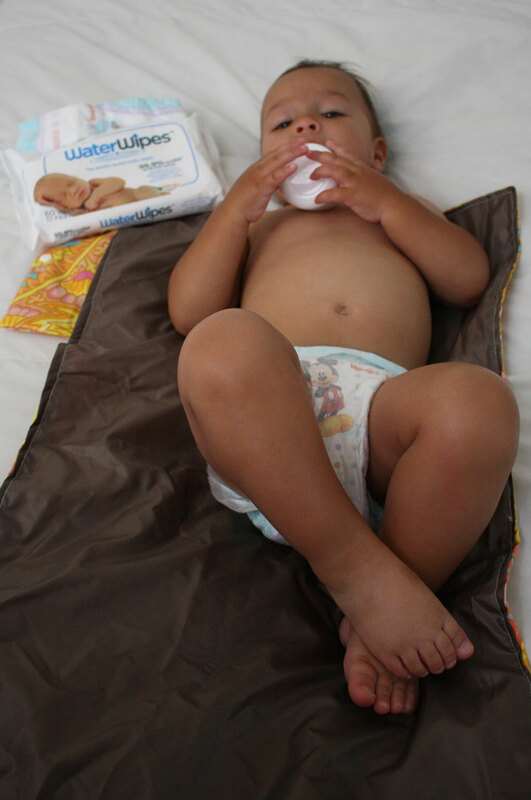 The #WaterWipes are on sale at Babies “R” Us 2 for 6$ (normally 3.99$) now through July. And from now until August 19th you can enter to with 100$ Babies “R” Us gift card using the widget below. Aside from wiping bums I keep the WaterWipes by Teddy’s high chair to wipe his face. I’ve never done that with other kind of wipes because you can taste the chemicals yuck. But with these ones they are just like a nice wet towel but way more convenient. I’m super glad I found them. Brilliant!! Wish I would have had one of those when mine Littles were babies! I LOVE the fabric you used on this! So cute! Thanks I adore that fabric! !